You are welcome to attend any of these activities. For dates and times please check Upcoming Events. Note: Three Wheels applies Child Protection Policy to all our activities. Morning service and Evening service are held every day and starts at different timing. (Please see the time table below.) 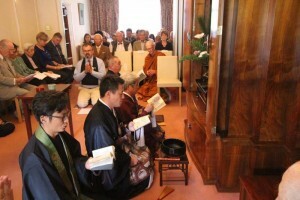 Services are based on the traditional Shin Buddhist liturgy and include chanting the Shoshinge (Hymn of True Faith by Shinran Shonin), Wasan (Japanese Hymns by Shinran) and the reading of an Ofumi (Letters by Rennyo Shonin). August London Eza, incorporating the Annual Ceremony to pray for World Peace and Reconciliation. These bi-monthly Meetings are the main events in Three Wheels calendar. After a formal Buddhist service a talk is given by a priest of Three Wheels or a guest speaker. 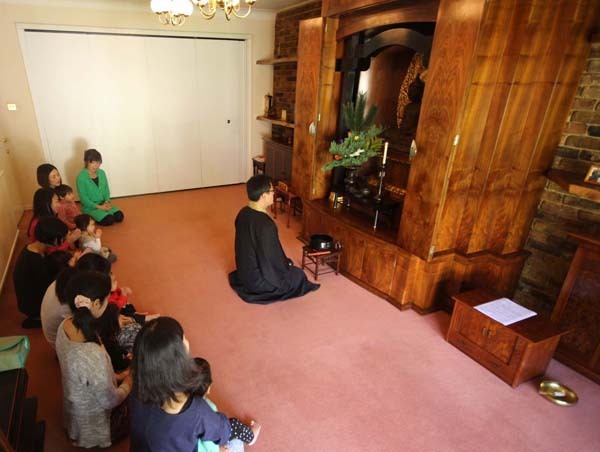 Each Eza is a time when many people, Buddhist and non-Buddhist, gather at Three Wheels with the main purpose of encouraging harmony within diversity and spiritual exchange and encounter. For the date of the next London Eza please see the Upcoming Events Calendar. 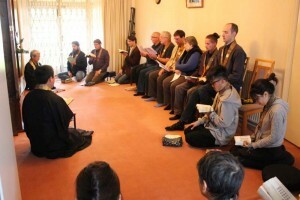 The first Shokai Retreat was held in May 2008 and have subsequently been held every Spring and Autumn at Three Wheels. Each retreat comprises of services to the Buddha, Dharma talks, meditation sessions and a lesson in sutra-chanting as well as group meetings and work periods in and around the grounds of the temple. The two characters in the term ‘Shokai’ mean respectively ‘letting flow’ (sho) and ‘opening’ (kai) and thus describe a period of spiritual practice designed to allow the waters of faith to flow freely both in the individual and inter-personal dimensions. The Director of Three Wheels continues a series of meetings to read and discuss his translation of The Great Rajagriha by Venerable Reion Takehara, Restorer of Shogyoji Temple. This Buddhist text helps you understand the religious meaning of the two important aspects in Shin Buddhist faith, 1) awareness of Ki (the self), or the sad reality of one’s Karmic existence, 2) awareness of Ho (Dharma), or the unconditional love of Amida Buddha that saves us all with no discrimination. This series of meetings is held at both Three Wheels and the Buddhist Society. 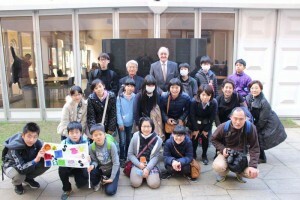 Students from Shogyoji Temple in Japan have been coming to Three Wheels every Spring, normally around the Easter period, since 1997. During their visit to Britain, they experience a wide range of activities from visits to local attractions and the countryside to English lessons and talks by various individuals. 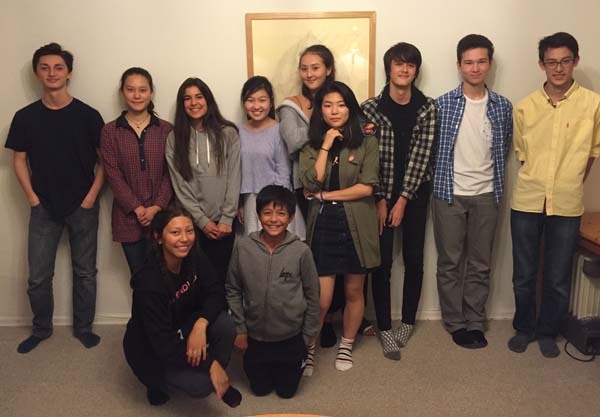 Most importantly their stay gives them an opportunity to truly encounter one another and realise, through living away from home, deep gratitude towards their parents, family and teachers. Meetings especially designed for students, including services, meditation and so on. This meeting for teenagers began in 2011 and has made it possible for secondly students to join religious activities and think about their daily lives. Many activities of this meeting are based on one of the most important aspects of becoming aware of interdependent relationships. Once a month children and their parents gather for a short Buddha Service, followed by a talk given by one of the priests or parents. Through discussing the story the children are encouraged to reflect upon and ask questions about their life and their surroundings. 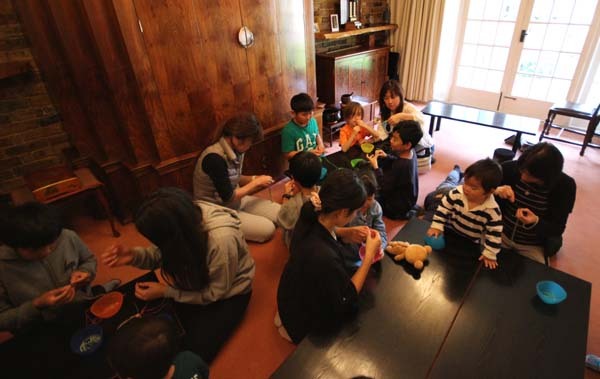 After the story the children happily play and take part in an activity based on the theme of the meeting. Parents are welcome to stay and supervise their children throughout the meeting. This monthly meeting is designed especially for mothers with infants and began in Oct 2015. The participants share their own joy, difficulties and sufferings in daily lives in order to make their lives happy. They find joy and solutions of difficulties through their mutual conversation. 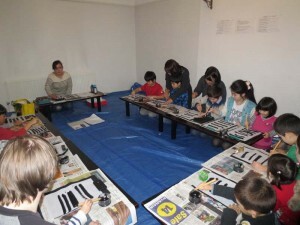 Enjoyable activities are organised by themselves. 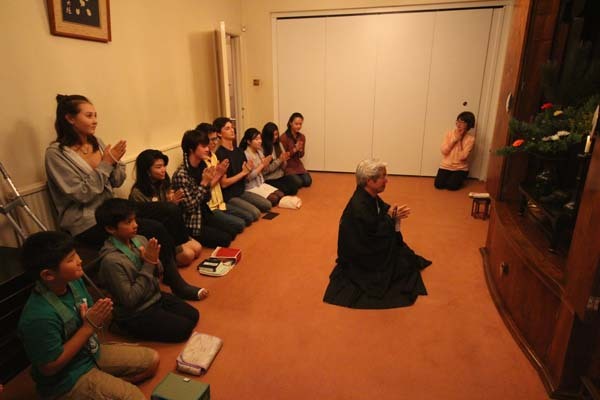 Meditation Classes are held every Monday evening from 19:30 to 20:30. Instruction is given on finding the correct posture and developing an inner peace and stillness in which to develop the core Shin Buddhist teaching of awakening gratitude towards Amida Buddha and deep listening to the Buddha Dharma. The sessions are based on the Zen practice of sitting mediation (zazen) but individuals are welcome to sit in ways that are comfortable and familiar to them. Please put on loose trousers as tight ones and skirts are not appropriate. Note: Meditation class does not appear in Upcoming Event page because it is a weekly event but does in Calendar page. Monthly Japanese language Meetings held at Three Wheels to listen to Dharma Talks given by Reverend Kemmyo T. Sato or Reverend Kenshin H. Ishii. This meetings are organised by ladies who weekly gather at Three Wheels. The participants discuss about their daily life, read Buddhist texts and help preparation work of Three Wheels’ activities.